ASTERICS is a 4-year project that brings together researchers, scientists, engineers, hardware and software specialists from astronomy, astrophysics and astro-particle physics. In these fields, new instruments are developed that have common challenges, such as the transfer, processing or storage of large amounts of data. By working together, common solutions to these challenges can be found. ASTERICS aims to facilitate and accelerate the development of these solutions by stimulating collaboration. In addition, collaboration allows researchers to study the same event in space and time using telescopes detecting different wavelengths and instruments detecting different messengers. The combined information from these wavelengths and messengers will lead to more insight than only looking at them from one perspective. The main focus of ASTERICS is on four large ESFRI instruments that detect different wavelengths and messengers: the Square Kilometre Array (SKA) for radio waves, the Cherenkov Telescope Array (CTA) for gamma rays, the Extremely Large Telescope (ELT) for visible light and the Km3 Neutrino Telescope (KM3NeT) for neutrinos. ASTERICS also works with research infrastructures that are already up and running, for example Low-Frequency Array (LOFAR), European VLBI Network (EVN), High Energy Stereoscopic System (HESS) and Very Large Telescope (VLT). 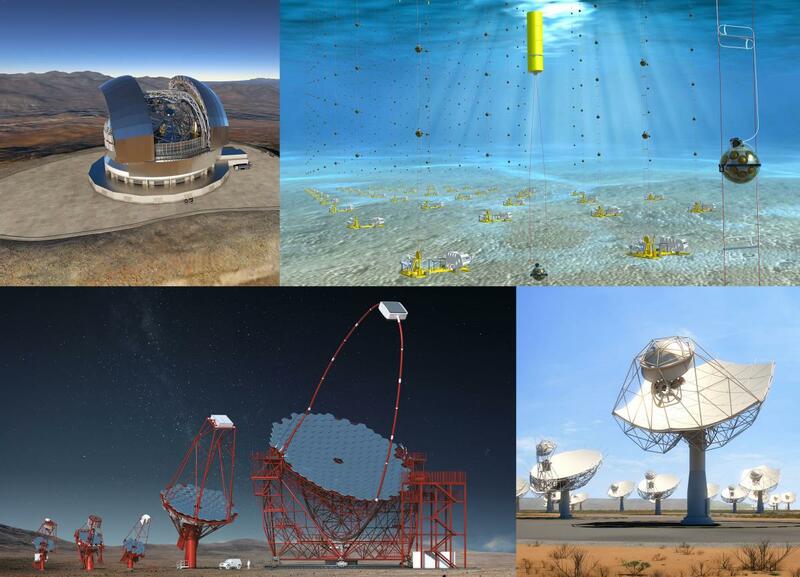 Solutions found for these research infrastructures can also be used at a larger scale for the ESFRI telescopes. An ESFRI research infrastructures is a facility, resource or service that has a unique nature to conduct top-level research activities according to the European Strategy Forum for Research Infrastructures. An ESFRI is identified and classified based on its importance for European research and innovation for the coming decades. SKA, CTA, ELT and Km3NeT are research infrastructures in astronomy and astro(particle) physics that have been classified as ESFRIs. ELT (top left), KM3NeT (top right), CTA (bottom left) and SKA (bottom right).